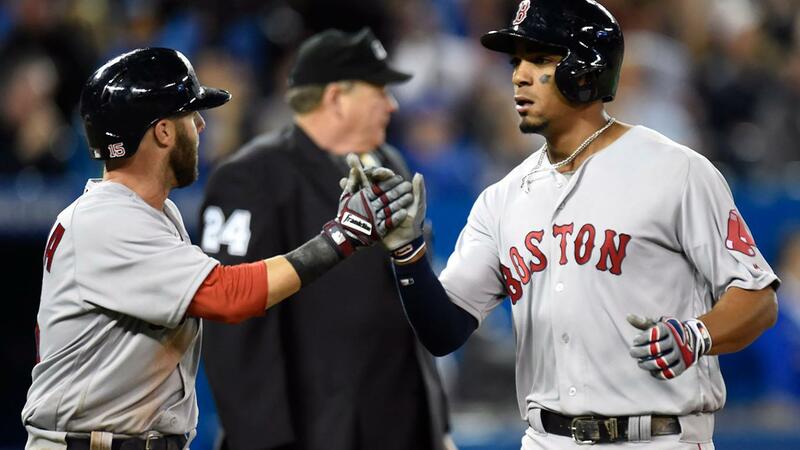 Dustin Pedroia had three hits and Hanley Ramirez added a two-run triple as the Red Sox continued to score early and often in an 8-4 victory over the Blue Jays on Saturday afternoon at Rogers Centre. Pedroia finished his day 3-for-5 with a double, a run scored and a pair of RBIs. Xander Bogaerts, Travis Shaw and Rusney Castillo also doubled as Boston scored at least six runs for the fourth consecutive game. Right-hander Rick Porcello picked up the victory after he allowed four runs on seven hits and one walk while striking out seven over six innings. "The biggest thing is the trust they're developing with one another," Red Sox manager John Farrell said. "Nobody feels like they have to be the guy within a given inning where they have to expand. Pass the baton, get on base and I think that's one of the primary reasons we're scoring the number of runs we are." Knuckleballer R.A. Dickey took the loss, after he suffered through a rough afternoon at the ballpark. His specialty pitch was moving a lot but Boston didn't seem to have any difficulty with it whatsoever as he allowed seven runs -- six earned -- on eight hits and two walks. "If you wallow in it, it doesn't help anybody," Dickey said. "So if there's one thing that experience has taught me, it's that you've got to turn the page quickly. Take what you can -- bad and good -- out of the outing and turn the page quickly. That's what we need to do." Jose Bautista provided the lone bright spot for the Blue Jays with a pair of home runs. He hit a two-run shot in the first and another two-run shot in the third to represent all four runs that were charged to Porcello. It was the 29th multi-homer game of his career but that did little to salvage an otherwise frustrating day for the Blue Jays. Offense relentless through four games: The offense has been the catalyst early on for the Red Sox, scoring six runs or more in all four games. The last time Boston scored six or more in the first four games was 1995, a season that saw the Red Sox win the American League East. On a day manager John Farrell rested star slugger David Ortiz, eight of the nine starters had at least one hit. The Red Sox trailed 2-0 after two, but scored three in the third, one in the fourth, three in the fifth and another run in the sixth. There was some good fortune involved when Ramirez hit what looked to be a line single in the fifth, only to have the ball take a high hop over Bautista and turn into a two-run triple. "This is kind of how we felt like we finished the year last year. Just that kind of grind you out, everybody contributes, everybody has their role type of thing," said Shaw. "Right now, it seems like everybody is settling into their roles in that lineup. To me, personally, it seems like it's a long, dangerous lineup." Down day for Dickey: The Blue Jays had a pair of leads at various points of Saturday afternoon's game, but Dickey was unable to keep the Red Sox off the scoreboard. He had allowed four runs through four and had even more trouble in the fifth. Bautista misplayed a ball in right field, which turned a would-be single by Ramirez into a triple. Brock Holt also added an RBI double in the frame as Boston chased Dickey from the game and took a 7-4 lead it would not relinquish. "Some of this is that you're dealing with guys who are the best in the world at what they do and you've got to tip your hat, but some of it is poor execution and I've just got to be a little more consistent," Dickey said. "I think if I am then I'll pitch in the seventh inning of that game pretty easily." Bautista bombs: Bautista single-handedly put the Blue Jays on his back early in the game with a pair of two-run homers. In the first inning, he went deep on a 1-0 pitch from Porcello that he lined over the wall in left for his first of the year. Two innings later, Bautista once again went deep with a two-run shot for the 29th multi-homer game of his career. Bautista's 175 home runs since 2011 are the most in the Major Leagues over that timeframe. Porcello settles down: After requiring six innings from the bullpen on Friday, the Red Sox could ill afford another abbreviated outing from a starter. Things looked a little dicey for Porcello when he threw a 26-pitch first. But the righty settled down and gave his team six innings. Aside from Bautista's second two-run homer in the third, Porcello didn't allow any damaging hits after the first. Josh Donaldson has at least one hit in all of Toronto's six games this season. He also has three home runs and eight RBIs and is performing well at the plate despite a strained right calf that has been lingering for a couple of weeks. Red Sox: After winning the fifth spot in the rotation late in Spring Training, knuckleballerSteven Wright makes his first start of the season in the finale of this six-game road trip on Sunday at 1:07 p.m. ET. The righty had a dependable stint in the rotation for the Red Sox last year, going 3-4 with a 3.96 ERA before suffering a season-ending concussion when he was struck by a line drive during batting practice. Blue Jays: Right-hander Marco Estrada will make his season debut when the Blue Jays close out their three-game series with the Red Sox on Sunday afternoon at 1:07. Estrada had a delayed start to the season because of a sore lower back that sidelined him for the first several weeks of Spring Training.